I had organized this Boealps outing as a climb of nearby Mt. Washington by the north ridge, but with the snow and weather conditions it was obvious that route wouldn't go. Instead, after some email exchanges, we decided to climb the west ridge of Bandera instead. In Dallas Kloke's excellent guidebook, "Winter Climbs: One Day Ascents", this route is described as having "little to no avalanche danger" - sounded great for this weekend! The one problem with climbing Bandera was that the snow level was well below the trailhead, making the road that you usually take to the trailhead impassable by vehicle. Instead, we chose to park just off I-90 under the trailhead, and bush bash our way up to the road. We had heard this was feasible, but none of us had actually tried this before. To get there, take Exit 42 off of I-90, and drive to the north side of the freeway. There's a dead end here to park at - make sure you're not on the pavement, as you can be ticketed for parking in an interchange. The way up to the Bandera trailhead starts out through a bunch of logging debris and hundreds of spent shot gun shells. (I have no problem sharing the woods and mountains with other recreationalists, but why are shooters so horrible about leaving a mess? The Mailbox Peak trailhead is another example of what should be an embarrassment to the shooting community.) As you work your way (carefully) up across lots of downed logs, you eventually climb up into some light brush. Stay between the drainages of the creeks on either side of you at this point, and in 30-45 minutes you'll come out on the road, maybe a half mile from the trailhead. After a quick stop to use the new (and from what I've heard, expensive) outhouse, we headed on up the old fire road that serves as the first portion of the trail. Instead of following the road all the way, we cut some distance off of our route by heading up through forest and moderate to heavy snow until we came out on the old fire road again. We followed some cross country ski tracks to the intersection of this road with the Mason Lake turnoff, and headed up towards the lake. The snow got much deeper here, but we weren't the first to come this way and had some footsteps to follow. We switchbacked up the nose and into the forest, with the light snow and thick trees keeping any worries about avalanche conditions at bay. 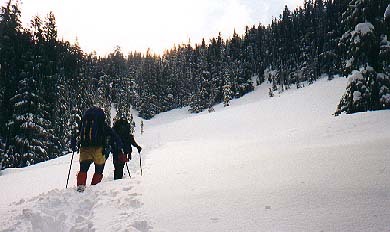 We followed the course of Mason Creek for a ways, and then broke out of the trees at the base of what is the boulder field in summer. Here we stopped to put on snow shoes, and discuss whether to climb straight up onto the west ridge here, or to continue underneath the ridge for a ways, looking for a "friendlier" access route to the ridge. 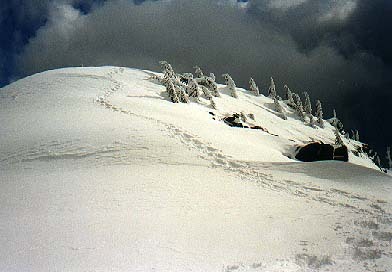 We chose to continue on, crossing the only area that seemed to me a bit dicey that day, from an avalanche standpoint. After crossing the boulder field, we hugged the base of the west ridge for another quarter mile or so, and, failing to find any "gimme" routes onto the ridge itself, bit the bullet, and started kicking steps up the steep, but heavily forested, ridge. The wind had been blowing from the south all morning, and so we had been thankfully sheltered. Breaking out onto the ridge, though, left us without any protection, and fleece and Goretex were quickly pulled on. The weather was varying between blue skies, and spitting snow squalls, so we were treated to short periods of wide views, followed by short periods of hiding inside our parkas. At the ridge, one member of the group decided he'd had enough, and sat down to make himself comfortable while the rest of us headed over for at least the false summit, and maybe a meander over to the true summit, if snow conditions allowed. Walking along the ridge allowed us to verify the high avalanche danger on the south slopes of Bandera, and to vicariously enjoy some cross country skiers who were playing and hooting down on the frozen surface of Mason Lake. We entered the small forest in the middle of the ridge, then broke out onto steeper slopes that approach the false summit. Once on the false summit, the snow conditions looked safe, so we dropped down, then climbed a subsidiary summit (what's the difference between a false summit and a subsidiary summit? I've wondered about that...), then dropped down again, and finally climbed up to the true summit. We stopped here for a quick lunch, and a few snapshots. Clouds threatening from the south, and our climbing partner waiting back at the start of the ridge got us moving back along the ridge fairly soon. Following our trail on the way down proved quick and uneventful, and even crossing the boulder field on the way back seemed safe enough. 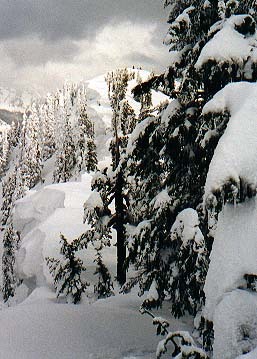 We used snow shoes until we dropped off of the approach road down into bushwhacking country again, and then took our time pushing through the underbrush and finally crossing the jackstraw piles of downed logs near where we had parked the cars. Time: 5 hours up, 3 hours down. Climbers: Mike Bingle, Doug Sanders, Ilan Angwin, John Fenstra, Matt Robertson.